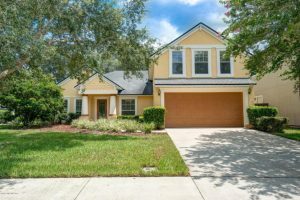 This weekend we have three open houses – two in Oakleaf in the Worthington Oaks and the Eagle Landing subdivisions, and one in St Johns in the South Hampton subdivision. Please come by and tour these beautiful homes this weekend. We have wonderful agents available to assist you and answer any questions you may have. Open House: Saturday, Sept. 23, 10:00 a.m – 1:00 p.m.
Beautiful 3,843 SF 2 story home in phase one of Oakleaf Plantation! Gorgeous wood look tile thru out the 1st floor, only 80.67 per SF. Large open floor plan with formal LR and DR, kitchen overlooks the breakfast nook and family room. Huge Owners Suite with Glamour Bath and sitting area. Beautiful staircase open to the entry foyer. Home has a fully fenced rear yard with too many upgrades to mention. This is the perfect home for entertaining plus a guest suite for company. Landscaping electrical outlets thru out exterior of the property. Electrical supply/panel for RV/Camper, 50 amp. 30 amp. and 20 amp. Upper AC unit installed less than a year ago, still under warranty. 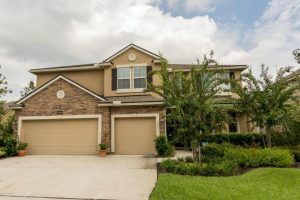 The Mandarin floor plan in Eagle Landing features architectural shingles, stucco and ledge stone front, crown molding, gourmet kitchen, California bar top, granite counter tops, recessed lights, step trey ceiling at master bedroom, trey ceiling at dining and stainless steel appliances. Eagle Landing offers an amazing variety of non-stop activities and amenities sure to please everyone in the family. The spectacular golf clubhouse will be a great place to gather. Eagle Landing’s fabulous Swim Park is loaded with excitement. 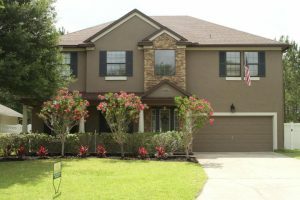 This home boasts 5 large bedrooms with 4 1/2 baths. custom built in pantry with custom built in mudroom off garage. This home has it all including a three car garage. Come and see this one for yourself. Located in South Hampton Golf Community, this lovely split-level 5 bed, 3 FULL bath, 2,481 square foot home has NO CDD FEEs and low HOA fees. Soaring ceilings brighten and lighten with updated windows. Ample 42′ cabinets and a large breakfast bar are ideal for entertaining large gatherings. The formal dining room provides for intimate seating. A large master suite with his/her walk in closets and vanities, soaking tub and spacious shower is the perfect escape from a busy day. The bonus room upstairs has a view of the 13th tee box tucked and includes a spacious walk-in closet and full bathroom. Perfect for a guest room or game room. Relax on your covered lanai or visit this golf community’s amenity center, large pool with splash park, fitness center, basketball & tennis courts, playground, and picnic areas with RV parking. St John’s Schools.